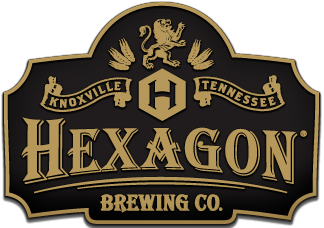 Hexagon creates products using the most locally sourced ingredients and materials to support the communities and craft beer fans of Knoxville and beyond. Hexagon is committed to delivering a consistent, enjoyable craft beer experience to the consumer by producing exciting beers in an economically and environmentally conscious brewery. With a focus on quality—from the ingredients all the way to the final pour—Hexagon Brewing Company delivers a standout product from a brewery the owners, employees and community can be proud of. The story of Hexagon Brewing begins in the Sierra Nevada Mountains. Lake Tahoe/Squaw Valley in the spring of 1996, to be exact. A young Stephen Apking was visiting his brother in California for a spring break snowboard trip. It was here that Stephen discovered his passion for craft beer. Drinking Tahoe Red Ale from Lake Tahoe Brewing Company quickly became a daily routine as he would stop for lunch at the Mid Station grill. Stephen was struck by the uniqueness of the flavor, and how drastically different it was from the brews he had been accustomed to on the East Coast. So began his journey. With no way to get that style of beer back home, he took it upon himself to brew his own. He read up on the subject and began trying as many microbrews as he could get his hands on. 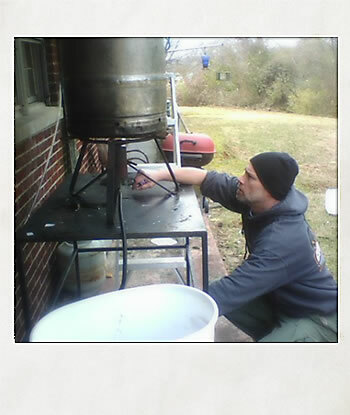 His first batches of beer tasted good, friends and family enjoyed them, and urged him to brew more. Over the years he gained confidence and began to brew bolder styles, experimenting on his pilot system and sharing his beer with as many people as possible. That same pilot system would go on to serve as a pilot system for numerous other craft breweries in the Knoxville area taking root in the 2000s. But just prior to the turn of the century, Stephen had an itch ... an itch for competition. Beer festivals were different back in the day. Much smaller crowds, far fewer brewers, and a totally different experience altogether. The men and women who were drinking craft beer in the 90s were pioneers in their own right. Many were homebrewers, and all shared a love for full flavor beer like it had been made in the past. Stephen learned from these individuals, and before long he was winning awards at various festivals in the area. He racked up five gold medals, three silvers, and one bronze over the course of three years; but more importantly, he had decided that one day he would open his own craft brewery. Fast-forward to 2014, and Stephen was beginning to lay the foundation for what would become Hexagon® Brewing Company by teaming up with Knoxville-transplant Matt McMillan. Matt’s interest in craft beer came at a much younger age, while assisting his father home brewing in the house he grew up in. At the time, he did not get to do much taste testing; but, as he grew older and became interested in beer, it was those brew days with his dad that he blames for guiding him on his life’s calling to chase good beer. Matt came into the craft beer business by way of his move to Knoxville to study engineering at UT. While there, he continued his hunt for good beer, and one day ended up at the recently opened Bearden Beer Market. It was not long after that he became one of the early employees. As he graduated, Matt dove further into craft beer by spending a couple years with Alliance Brewing Company, before they eventually settled in South Knoxville. 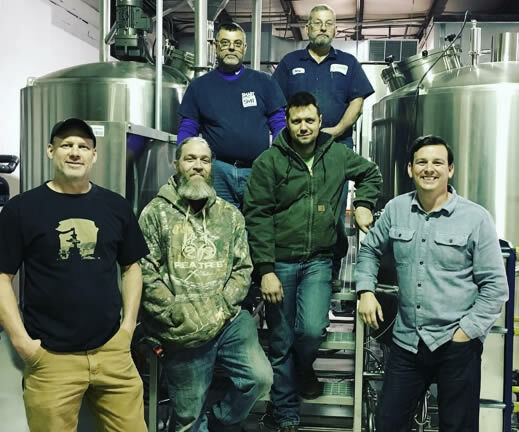 Matt’s years of experience in retail and brewery planning paid off, and now teamed up with Stephen, the two began to plan out a brewery that could crank out righteous beer for their community, with an overemphasis on the East Tennessee region. Working with other local businesses and service providers, Hexagon has been designed and crafted from the ground up with a focus on quality and purpose. Careful attention is paid to every detail, with the goal of not only serving great beer, but also telling a great story. Because at the end of the day, craft beer goes with a great story. The hexagonal shape is where this story begins. The founders of Hexagon Brewing Company searched far and wide to come up with a name that not only had meaning, but also was 'free and clear' on the open market (any brewer will tell ya, coming up with an unused brewery name can feel damn near impossible!). Little did they know their inspiration was all around them. Stephen was an avid beekeeper; the honey comb structure, also similar to the design of the snowboards and wakeboards that brought him in contact with craft beer, gave him the idea to use the hexagon shape as motivation for a name. But, it was a bit of fate that solidified Hexagon as the brewery name. During the time a decision had to be made about the name of the brewery, Stephen got a call that would take him to Ohio on a hunt for the fly rods his grandfather taught him to fly fish with. After finding the rods, he came upon a signed copy of a book by the maker of the rods, Wayne Cattanach. Stephen flipped a few pages and came across the explanation of the hexagonal structure used in making these particular bamboo rods. It was as if his grandfather had reached back and gave him just the guidance he needed at this particular point in the infancy of what would soon be called Hexagon Brewing Company. With Hexagon the brewery name, they hit the ground running. Stephen and Matt worked for several years to put all the pieces together to start the brewery: putting a plan together, selecting equipment, raising funds, finding a location, design/layout, etc. Finally, in June 2016, with everything in place, the first swing of a hammer started demo and build-out process for their new brewery at 1002 Dutch Valley Drive. Over the next 8 months, the work went on to build a production facility and taproom based on a steam-fired, 20-barrel SMT brewhouse mated with a 3.5-barrel pilot system. The big system would allow them to make enough beer to distribute to the market, while the pilot system would allow them to create fun beers and continue experimenting. On Saturday, February 18, 2017, they fired up the pilot system for the first time, and so began the exciting next stage for Hexagon, brewing great beer for Knoxville and beyond to enjoy. Cheers! 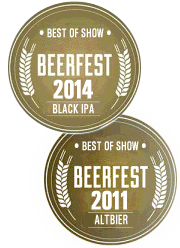 On to our beers, and thank you for your interest in Hexagon Brewing Company.